AFSCN Pune (Air Force School),Pune Published Job Notification for Sports Coach – Lab Attendant & More Posts. Candidates who wish to apply must look at AFSCN Pune Sports Coach – Lab Attendant & More Recruitment 2018. Eligible candidates can apply Offline before 20-03-2018. Education Qualification: Master Degree/ B.Ed/Bachelor Degree/Master Craftsman/12th Science and More. For Post wise Education Details follow the detailed advertisement. Age Limit: 21-50 Years as on 01-07-2018. 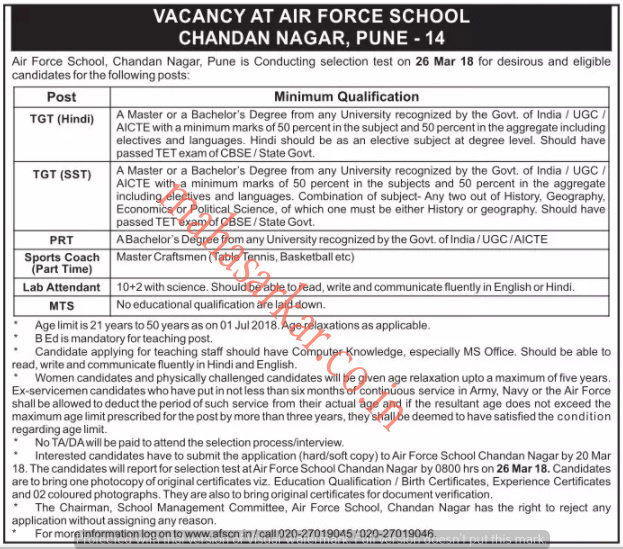 Interested & Eligible candidates can send their application along with all the necessary documents and testimonials to Air Force School, 9 BRD, Nagar Rd, Chandan Nagar, Pune, Maharashtra 411014. Starting Date, Last Date to Apply Offline at Air Force School which candidates should be remembers as follows. Start Date to Apply Offline: 03-03-2018. Last Date to Apply Offline: 20-03-2018. Date of selection Test: 26-03-2018.